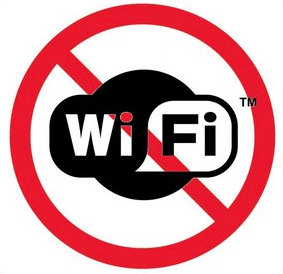 Emed > News > Wifi In Schools – Should It Be Banned? Wifi In Schools – Should It Be Banned? It’s hard to avoid the wireless revolution that has hit in the last 15 years. Mobile phones, internet, tablets, smart meters and even a wireless birth control is in the pipeline. It’s common place to see young kids and even babies playing with mobile phones or iPads. Parents know that it’s an easy distraction and a cheap babysitter. Australian schools are now introducing Wi-Fi into classrooms despite questions over the long-term safety of wireless technology. As it stands we don’t know the true affect on adult health yet we are exposing millions of children everyday to this potential carcinogen, radio-frequency electromagnetic fields or Wi-Fi as its commonly known. In Australia, 90% of children use the internet at home, whilst almost 30% of 5-14 year olds and 75% of high school students have a mobile phone. Now children are also faced with the added effect of 6 hours of WiFi exposure on school days. With reports of sleep disturbances, learning disorders, heart problems, muscle weakness and skin sensitivities are we putting our children’s health at risk for convenience? Lets take a closer look at WiFi radiation and the potential health risks to our next generation. The influential American Academy of Pediatrics has called for a review of radiation emissions from mobile phones and Wi-Fi, warning the existing safety limits are “not an accurate predictor of actual exposure’’. France has legislated to discourage Wi-Fi in schools until it is “safe for human consumption’’, Germany has recommended its schools use cabled computers instead of Wi-Fi and the Council of Europe has called for a ban on Wi-Fi in classrooms. The Israeli Ministry of Education has told schools to use wired computers in preference to Wi-Fi in classrooms, and requires teachers to turn off Wi-Fi routers when not in use. Currently Australia has WiFi and mobile phone emission standards for adults but not children. Scientists remain uncertain as to whether children’s developing brains might be more vulnerable than adults to exposure to radio waves that are emitted from mobile phones and other wireless technologies. Waiting for high levels of scientific proof before taking action on electromagnetic fields can lead to very high health and economic costs, as was the case with asbestos, leaded petrol and tobacco (Council of Europe, 2011). It’s widely known that children, due to their thinner skulls, smaller brains, softer brain tissue and far more rapidly dividing cells, are far more susceptible to damage from cell phone use than adults. 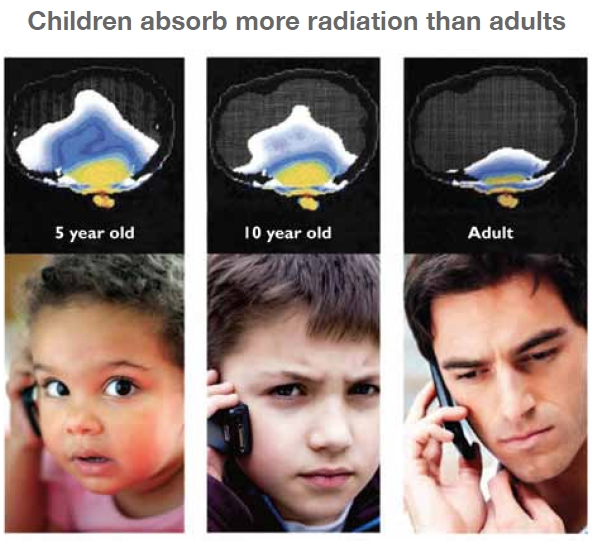 More radiation is absorbed in a child which can also effect bone marrow concentration. Research into radiation from cell phones and Wi-Fi has already been shown to cause diminished reaction time in children, decreased motor function, increased distraction, hyperactivity and inability to focus on complex and long-term tasks. After a group of Danish high schoolers noticed problems with concentration, scientists began to look at the impact of 4G radiation on brain function. Using MRI technology, research performed in 2013 found that persons exposed to 4G radiation had several areas of reduced brain activity. Uncertainties Can Be Harmful – What Further Research Is Being Done? A new Study of Cognition, Adolescents and Mobile Phones (SCAMP) has been set up in the UK to evaluate whether devices that emit radio waves (mobile phones/wireless internet) might affect children’s cognitive or behavioural development e.g. language comprehension, attention and memory. This 3 year study of 3000 school pupils will be the largest study to date to address this once and for all. This research will improve understanding of children’s radio-frequency exposures and whether there are any possible cognitive or behavioural effects linked to exposure. This study will also provide age specific emission standards. Distance is the key- its called the inverse square law and it essentially means as you double the distance away from the WiFi source, you will reduce your exposure to it by 75%. Its the cheapest, simplest and most effective advice I can give. Keep at least 1 metre at a distance from the source especially in areas where you spend time such as the bed, favourite couch, desk and so on. Internet connection: use a hard wired connection such as ADSL or cable. If you do not wish to do this, the router should be kept well away from where you spend time such as the bedroom and living spaces. As such the garage, or spare bedroom would be better. You should also turn off the router when it is not in use especially at night before you go to bed. Cordless phones – avoid them! The base station will emit radiowaves continuously even when the phone is not in use and as such should be treated in the same light as a mobile phone. Replace it with a hard wired corded phone. Put the mobile phone and ipad in airplane mode when the kids are playing games. Use your cell phone only where reception is good: The weaker the reception, the more power your phone must use to transmit, and the more power it uses, the more radiation it emits, and the deeper the dangerous radio waves penetrate into your body. Ideally, adults should only use their phone with full bars and good reception. Many more tips can be found in the handy Healthy Home Healthy Family book. EMRs from WiFi and mobile phones have been shown to suppress Melatonin production. This powerful anti-oxidant protects nuclear and mitochondrial DNA and is produced mostly at night to aid our sleep cycle. Night time melatonin production can be reduced when individuals sleep beside cell phones, cordless phone bases or digital clocks. Turning off these devices are essential for anyone suffering from sleep disturbances. Getting teenagers to turn off their phones or leave them in a designated room of the house is a good way to prevent dips in melatonin production and also prevents night time texting. As Melatonin is unavailable without a prescription in Australia, 5-Hydroxytryptophan is an amino acid which can be used to produce Melatonin. For more information on 5HTP, talk to your Emed Practitioner today. Increasing foods high in Tryptophan will also help to increase Melatonin production. Highest concentrations are found in spirulina, soy beans, turkey, sunflower seeds, atlantic cod and oats. Get informed and involved. Every parent should have a say in what your child is exposed to while they’re at school. If you would like to know more about the removal of WiFi in your children’s school or how to further educe their risks, contact WiFi in Schools Australia for more information. On Tuesday, 16 February 2016, the ABCs science program Catalyst aired a story titled ‘WI-FRIED?’ which explored the concerns of a growing number of scientists that the widespread use of Wi-Fi and Wi-Fi-enabled devices could be slowly making us sick. Of increasing concern is that Australia appears to be lagging behind China, Italy and Switzerland and Russia that have standards 100 times safer than Canada’s standards, and that’s the same as Australia’s standards. While the Australian Government’s position on wi-fi remains unchanged, other countries are making changes to minimise the risks. In France, for example, legislation was passed banning wi-fi in nurseries and day care centres. The National Library of France and other libraries in Paris have removed wi-fi networks altogether. Additional recommendations include not having a router in your bedroom or classroom and don’t have a cordless phone next to your bed. If you can’t avoid it and you’re in a small apartment, get in the habit of turning the router off certainly when you’re sleeping. Is Your Brain Under Threat From Your Modern Lifestyle? Is Your Home a Toxic Hell? World Health Organisation, IARC Monographs of the Evaluation of Carcinogenic Risks to Humans, 2002, Non-Ionizing Radiation, Part 1: Static and Extremely Low-Frequency (ELF) Electric and Magnetic Fields. Vol. 80, IARC Press. Healthy Home Healthy Family - Is where you live affecting your health? It’s been my observation that everyone with a brain health problem – be it depression or whatever – is made worse by wireless and mobile radiation. The people who put wireless devices into schools and workplaces are condemning a lot of people to being significantly more ill.
As a High School teacher I am amazed at how little research has gone into the effects of Wi-Fi emissions on children. The system of bring your own devices to school guarantees that every child is exposed to these emissions all day, and then many of them log onto their network as soon as they go home, and play games with their friends. Surely everyone should be asking, Is this harmful to this generation? How will this effect my child? 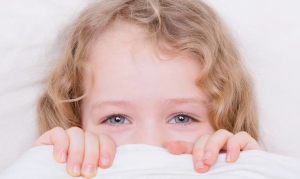 What is being done to ensure that my child is safe from harm? My young granddaughter is going into grade 4 this year and has been told she needs a touchscreen computer – how close will she be to the emissions? Photos are shown of children sitting on floors with the laptops in their laps – maximum exposure to these dangerous emissions. The question is, Who will be first to sue the Education Department?